I don’t always show media on my blog but this week I was featured in Page Six and I thought I’d share the story with you because it talks a bit about my backstory. People often ask me how I got my start, if I had one event that helped shape my career early on and what my early days as a wedding planner were like. And Page Six interviewed me about exactly that. I’ve been in this business a long time. I’m lucky to have sustained and grown my company year after year and in that time, I know I’ve had some wonderful breaks, amazing clients who have helped me get there and the best team in the business by my side. I’ve also put in countless hours and I give 100% all of the time and I wouldn’t have it any other way. Did you know that early on in my career I planned the wedding of Brooke Shields and Andre Agassi? That was really a tipping point for my company that got the phones ringing. I learned a lot on that job, some of which I talk about in my interview with Page Six here. Check it out and get a few details of how we pull off celebrity weddings in times of paparazzi and more. 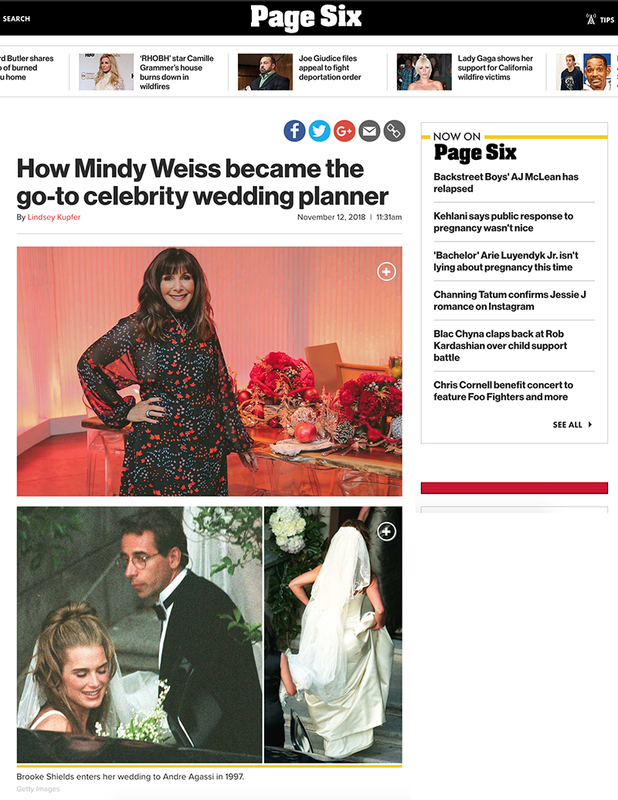 Thanks to Page Six for the feature!